While summertime weddings are popular, there is something to be said for a fall wedding. Charming yet colorful, autumn weddings can range from playful to elegant, as the available color schemes and motifs allow for endless creativity. These seasonal themes can be adapted to fit the personal preferences of the soon-to-be-married couple, and can also be modified to go in line with the current trends. There are a number of unique choices available to you to help set your wedding apart from those summertime affairs. 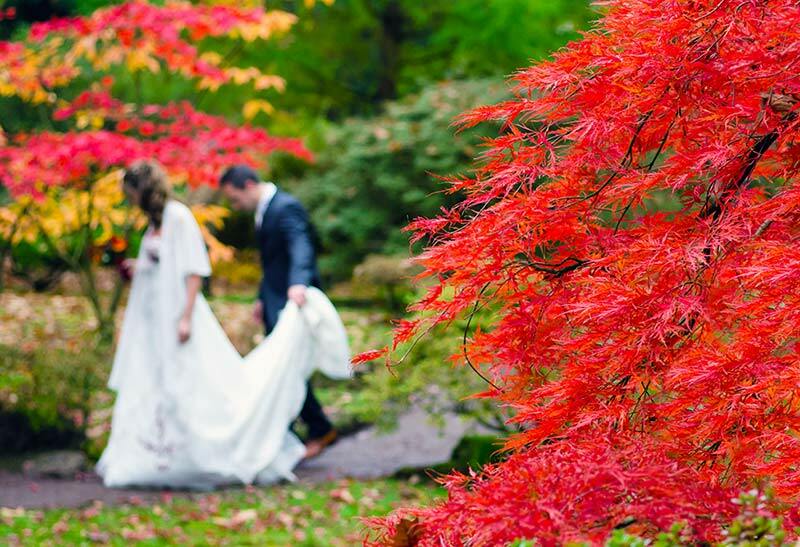 If you need some creative inspiration this season, check out some of the most popular autumn wedding themes. If you want to have a natural color palette for your wedding, use the warm hues of autumn’s leaves as your inspiration. If you happen to live in an area that experiences the color changes of fall, leaves are all around you so incorporate them into your wedding. It’s eco-friendly and is a great way to save some cash if you are on a budget. While it may be cold outside, it’s easier than you think to bring the outdoors, indoors. By going with a woodland theme, you can incorporate the beauty of fall forests into your wedding. The best part is you can combine other natural elements besides branches. You can blend in flowers, pinecones, moss and other greenery to transform your indoor space, so it has an outdoorsy feel to it. The fall season is harvest time, and if you love farming (and food! ), maybe you should incorporate these elements into your wedding. Bonus points if your wedding takes place on a farm! Think mason jars, wood, warm candles, corn, pumpkins, sunflowers, wheat, apples, squash, and berries as your décor accouterments, which leaves the door open to lots of variety and creativity. While Halloween is over, you can still incorporate some of its elements into your fall wedding. For some people, Halloween may be every day, or maybe you just have an overwhelming love for the holiday and its decorative elements. Plus, the black, red and white or even black and purple color scheme can be quite beautiful. No matter where you stand, Halloween touches can be either spooky or elegant, the choice is yours!